Sophie Thornton is a biomedical geneticist and molecular researcher at the University of Liverpool whose main responsibilities include: the day to day running of the MLPA and MSA prognostic service, providing technical support to the Ocular Oncology Research team, and assisting in research studies. Sophie is a self-starter who wrote and successfully obtained funding for her own Ph. D. project grant whilst simultaneously excelling in a full-time biomedical research role. Sophie’s PhD focusses on enhancing prognostication for patients with uveal melanoma. Sophie has designed targeted next-generation sequencing cancer panels, looked at disease biomarkers and analysed large population data sets to analyse trends in metastatic progression. Sophie is also a student mentor and supervises under/post graduate student research projects. Sophie specializes in the development of genetic tests for cancer, focusing on rare intraocular tumours. 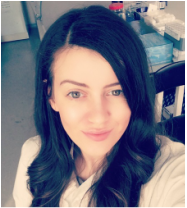 Sophie has over 7 years of combined professional experience conducting biomedical research, assisting with clinical trials/medical studies and sales. Sophie is responsible for performing specialized prognostic genetic testing for patients with eye cancer across the globe. Smit KN, van Poppelen NM, Vaarwater J, Verdijk R, van Marion R, Kalirai H, Coupland SE, Thornton S, Farquhar N, Dubbink HJ, Paridaens D, de Klein A, Kiliç E. (2018) . Mod Pathol. 31(5):763-771. Patterns of BAP1 protein expression provide insights into prognostic significance and the biology of uveal melanoma. Thornton S, Farquhar N, Coupland SE, Coulson JM, Sacco JJ, Krishna Y, Heimann H, Taktak A, Cebulla CM, Abdel-Rahman MH, Kalirai H. (2017) J Pathol Clin Res. 13;4(1):26-38. RasGRP3 Mediates MAPK Pathway Activation in GNAQ Mutant Uveal Melanoma. Chen X, Wu Q, Depeille P, Chen P, Thornton S, Kalirai H, Coupland SE, Roose JP, Bastian BC. (2017) Cancer Cell. 8;31(5):685-696.e6. Two different tumours in the same eye. Fiorentzis M, Heimann H, Thornton S, Coupland SE. (2017) Clin Exp Ophthalmol. 45(3):299-301. Krishna Y, Kalirai H, Thornton S, Damato BE, Heimann H, Coupland SE. (2016) Br J Ophthalmol. 100(7):1012-1016. Bilateral Diffuse Uveal Melanocytic Proliferation: Molecular Genetic Analysis of a Case and Review of the Literature. Mittal R, Cherepanoff S, Thornton S, Kalirai H, Damato B, Coupland SE. (2015) Ocul Oncol Pathol. 2(2):94-9. Concordant chromosome 3 results in paired choroidal melanoma biopsies and subsequent tumour resection specimens. Coupland SE, Kalirai H, Ho V, Thornton S, Damato BE, Heimann H. (2015) Br J Ophthalmol. 99(10):1444-50. Nissen E, Armitage J, Thornton S, Coupland SE. (2015) Pigmented Limbal Nodule Consistent With a Ciliary Body Nevus in an Organ Donor. JAMA Ophthalmol. 133(6):721-3. Coupland SE, Kalirai H, Ho V, Thornton S, Damato BE, Heimann H.
Pigmented Limbal Nodule Consistent With a Ciliary Body Nevus in an Organ Donor. Nissen E, Armitage J, Thornton S, Coupland SE. JAMA Ophthalmol. 2015 Mar 19. doi: 10.1001/jamaophthalmol.2015.214. [Epub ahead of print] No abstract available.